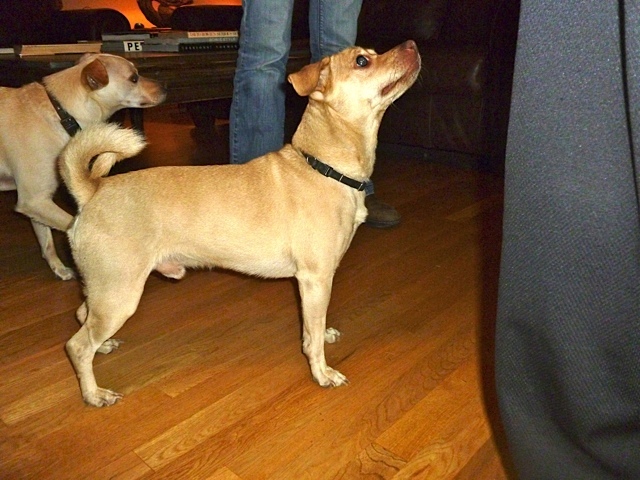 ← Two Special Little Dogs in Need of a Great Home! 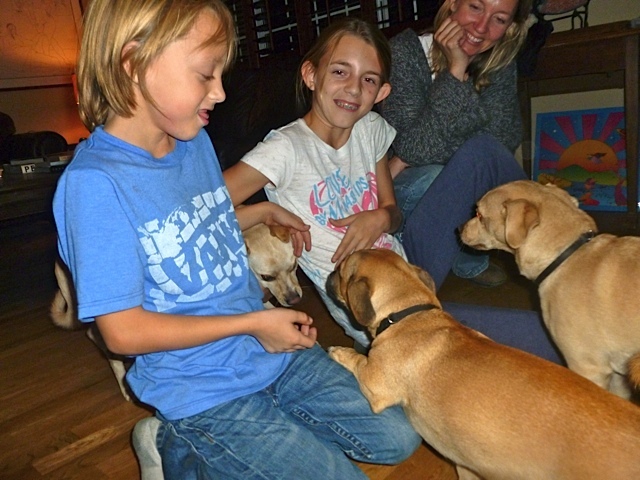 Lost Dogs Update – Great Home Found! My friend, Fred Coury (yes, that Fred Coury), has a studio here on the premises and had taken a heartfelt interest in Holmes and Sherlock. He would typically see them around the lot multiple times a day and would always go out of his way to say hello and interact with them. They sure loved him, and he likely would’ve adopted them himself had he not already had a couple pups of his own. So, right when I forwarded him the link of the last “home needed” post, he got a hunch to call Bobby – a mutual friend and colleague of ours – and basically said, “You must adopt these dogs. I’ll text you a pic.” And that was basically it! When Bobby and his wife saw the pic Fred sent, they felt an immediate connection to Holmes and Sherlock and knew these were “their” dogs – no question. They had just saved a dog named Beau from the pound last year and had been considering getting him a companion or two these past few months. Now was the time. It’s always a big change for everyone – dogs and humans – when new doggies are integrated into a new household… especially when there’s already a doggie there! But it doesn’t have to be difficult. So, to ensure the smoothest transition, the pups and I connected with my good friend Parker Bartlett (LA “dog whisperer” extraordinaire) and we all headed out to Bobby’s place. Parker, who I’ve mentioned around here before, had been helping me out with the dogs over these past few weeks, and is an expert in all things canine. She also had a keen insight into the intricacies of Holmes’ and Sherlock’s special traits, so I thought it would be great to have her on hand for the initial homecoming. The “B” family home is perfect! It’s on the outskirts of LA, where the trees are tall, the air is clean, and the trails and canyons are plentiful. Their home is warm and spacious and the whole family is cool, gracious, and extreme dog people. When we first got there with the pups and eventually made the introduction to Beau, he wasn’t quite sure what to make of these two new intruders. But he was definitely interested in playing right away. So we took a little time, kept everyone on leashes at first, and followed Parker’s lead as to the what and how. Before long, we were all inside, “off-leash,” and the dogs were already getting things sorted out. Bobby and I stepped outside with the dogs at one point, and that’s when the real action began. These three went tearing around their massive yard, chasing after each other, having the best time… like they had all known each other for ages. Truly – this was meant to be. Notice the crazy similarities between Sherlock and Beau? Trippy! All initial reports since have been glowing. Everyone’s happy, and Holmes and Sherlock (who will now also get their “forever” names) have acclimated incredibly well… “like they’ve been living here for years,” Bobby told me. It all worked out this time, gang. And remember – spay/neuter, get tags, get microchips, do the right thing by your companion animals. They depend on us. This entry was posted in Veganism/Animal Issues and tagged adoption, bobby rock, dogs, lost dogs. Bookmark the permalink. 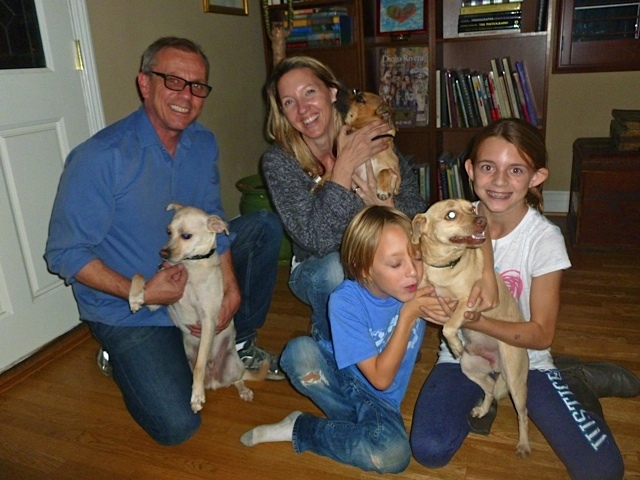 4 Responses to Lost Dogs Update – Great Home Found! I adopted my Tigger today! What a fantastic family they all seem to be! I’m very, very happy for Holmes and Sherlock… and thank you (and Parker) for taking such good care of them until they could be in their forever home and a part of their forever family. So glad you shared the good news, dear Bobby! Can’t wait to meet my new little ‘grandpuppies’- they are gonna love their “Nonna”. So happy it all worked out!